Dubi Ogbonna’s quick-fire second-half strike sent Kettering Town back to the top of the Evo-Stik Southern League Division One Central as they beat Beaconsfield SYCOB 2-1 at a perishing Latimer Park. The striker found the target just 12 seconds after the restart with an excellent finish and that proved decisive. It wasn’t always convincing, far from it. But, after three-and-a-half weeks without a game, perhaps it was understandable. On a pitch that was pretty much frozen by kick-off, the Poppies put a shift in and got the job done. New signing Gary Mulligan had to be content with a place on the bench as Ogbonna started as a lone forward while Elliot Sandy was alongside Andy Gooding in a 4-1-4-1 formation. Beaconsfield didn’t arrive until just before the scheduled 7.45pm kick-off meaning the game was delayed by 20 minutes. And once it got under way, there was little to warm the the freezing souls as the opening exchanges were fairly uneventful. Considering they arrived late, Beaconsfield were lively and gave the Poppies little time to settle. The visitors created the first chance when Kurtney Brooks’ shot was deflected away for a corner off Brett Solkhon after a free-kick hadn’t been cleared properly. But the Poppies did find their rhythm eventually and Ogbonna sent a shot across the face of goal when he probably should have squared to the unmarked Sandy. However, the hosts did take the lead just before the half-hour. And it was a neat move as Sandy found Ogbonna and his pass released Hall who showed good composure before beating Brendan Hackett with a low shot. 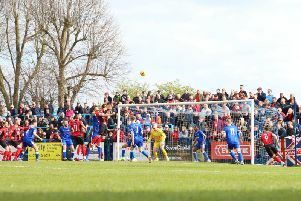 The visitors almost drew level when Jones took aim from distance after Richard Knight had raced from his goal to clear. The ball fell to the midfielder but Knight got back to save. Ogbonna forced Hackett into a good save with his legs after he was put away by Sandy’s back-heel. But Beaconsfield continued to threaten and they drew level shortly after Victor Osobu shot wide while the Poppies appealed for handball. And the equaliser was a stunner as Jones exchanged passes with a team-mate and then let fly with a spectacular half-volley that Knight could only watch fly into the top corner. Clearly, that annoyed the Poppies because they responded with just 12 seconds on the clock in the second period. The ball was played down the right-hand channel. Ogbonna took it down wonderfully well and then found the far corner with an excellent finish. James Jepson headed wide from an Andy Gooding free-kick soon after while Claudiu Hoban was booked for diving when he went down under a challenge from Hackett after he was sent clear by Jepson. Ogbonna had another sight of goal after a decent pass from Hoban but Hackett was out quickly to block the shot. But the Poppies weren’t always convincing. They struggled to keep possession and, while Beaconsfield created little, they were given plenty of invitations. Ogbonna sent another effort just over while Mulligan was thrown on for his debut for the final quarter-of-an-hour. However, it proved to be more of a case of Kettering seeing the game out as the nerves around Latimer Park grew. In the end, they did it but not without a scare after Osobu threatened to get in, only to see the ball run away from him. The final whistle was met with as much relief as joy as the Poppies returned to the summit. Poppies: Knight; Clifton (sub Robinson, 80 mins), Solkhon, Lee, Kinniburgh; Jepson; Hall, Gooding, Sandy (sub Mulligan, 76 mins), Hoban; Ogbonna (sub Kolodynski, 87 mins). Subs not used: Moreman, Bukasa. Beaconsfield: Hackett; Togwell, Guramishvilli, Murray, Gant (sub Martin, 90 mins); Jones, Brooks, Carey; Walker (sub Patrick, 85 mins); Osobu, Kelynack (sub Berry, 61 mins). Subs not used: Bunting, Souza. Goals: Hall (29 mins, 1-0), Jones (43 mins, 1-1), Ogbonna (46 mins, 2-1). Bookings: Togwell (foul), Hoban (diving).